Pousadas are a typical accommmodation in Portugal. Since the Pousada do Pico do Areeiro closed its door, the Pousada dos Vinhaticos is the only remaining pousada on Madeira. 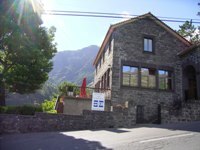 There is the main building with the restaurant and cellar bar, 11 double or very large triple bedrooms. The interior is very rustique which is typical for a pousada. I suspect it's an old English style, probably dating back to the 19th century. The second building which is constructed at the back of the hotel ressembles and finnish cabin. It has 10 smaller bedrooms, fit for singles or couples. The majority of the guests have selected this hotel as a perfect starting point for Levada walks through the mountains. Then there is of course the lovely setting of the hotel in between the Pico do Galo and the Pico Grande in the heart of Madeira's nature. Pousada dos Vinhaticos is a 4 start mountain hotel and belongs to the hotel group "Dorisol Hotels of Madeira". The hotel is situated at a height of 900m, near the village of Serra de Agua on the road from Ribeira Brava (6km) to Encumeada. Serra de Agua is 26 km away from Funchal and 44 km from the airport. The hotel is surrounded by the laurel forest (laurisilva). Note the name of the hotel comes from the vinhatico, an evergreen tree species. The mountain view from the hotel is impressive with the Pico do Galo, the Pico Grande and Bica de Cana to name just a few if the higher peaks. There are 21 rooms, divided among the authentic main building and a side building. There is a cellar bar but unfortunately no barman could be seen when i was there. Drinks could be ordered in the restaurant. Next to the parking space there is an outdoor bar that closes at 6pm. The free parking space is a too small for the hotel capacity but surely you can park on th road in front of the pousada. A nice extra, and well appreciated by walkers, is the laundry service offered by the hotel. The restaurant offers a nice mountain view on the Pico do Galo. The interior is well-decorated with a lot of wood and hunting trophees. English breakfast can be taken from the buffet. Half board is highly recommended here as the Pousada dos Vinhaticos is well known for its excellent gastronomy. The 3 course menu includes international dishes and regional specialties such as espetada (beef on a skewer), Bacalhau (codfish) or Espeta (black scabbard fish). Halfboard costs no more than 16,5 Euro per person. For children this is approx. 10 Euro. The hotel is very child friendly. Should the children don't like the main dish offered in the menu, then they can order Friench fries with chicken or a small steak at no extra charge. 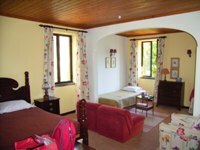 It is a very cheap hotel (summer 2008, 48 Euro for a double room in B&B) which offers value for money. Some renovation may be needed in hotel rooms of the main building, but don't forget this is an old mountain hotel. Otherwise it must be said that our triple room was very spacial. It was a bit ennoying that the frontdoor gets locked automatically so we had to ring the door bell each time we wanted to get in. There is no entertainment in the evening. After dark there is nothing to explore outside and a bar without barman is not really attractive so all you have is your room, your company and a TV. Therefor the hotel is not fit for those who like to go out in the evening. The hotel remains highly recommended to spend one or two nights due to the cheap rates, the delicious foods and its exceptional location amid nature. Half board is highly recommended! Keep in mind that there is no other restaurant or cafe on walking distance. Prepare for some warmer clothes. The hotel is set high up in the mountains so, also in sommer, it occasionally gets some colder and windy. From the airport you will need 45 to 60 minutes by car to reach the hotel. Take the highway towards Ribeira Brava. From there drive in the direction of Sao Vicente. Turn left before the tunnel, at the sign "Sao Vicente via Encumeada".